Kerala Blasters who are placed on the number nine spot of the ISL 2019, have had a disastrous season so far in the ISL 2018-19. Goa FC who will be hosting the ISL 2018-19 game, would be looking forward to winning this match as to seal a berth in the playoffs. Placed on number two of the ISL 2018-19 points table, the team has 28 points in its kitty. Having played 15 matches in the tournament, the team has won eight games and lost three. Four of their matches ended with a draw. FC Goa vs Kerala Blasters FC - Live Football Score. When is the FC Goa vs Kerala Blasters FC, Hero ISL 2018-19, Football Match? Know Date, Time and Venue Details of the 80th Indian Super League Game! The 80th match of Indian Super League (ISL) Season 5 will be between FC Goa and Kerala Blasters FC on February 18, i.e. Monday. The contest will be played at Fatorda Stadium in Goa and is scheduled to begin at 7.30 PM (IST). Where to Watch the Live Telecast of FC Goa vs Kerala Blasters FC, Hero ISL 2018–19, Football Match? The official broadcasting rights of ISL Season 5 in India happens to be Star Sports Network. The fans will be able to catch the live match telecast with English commentary on Star Sports 1 and Star Sports 1 HD channels. The game can also be seen in Hindi commentary, too, on Star Sports 3 channel. 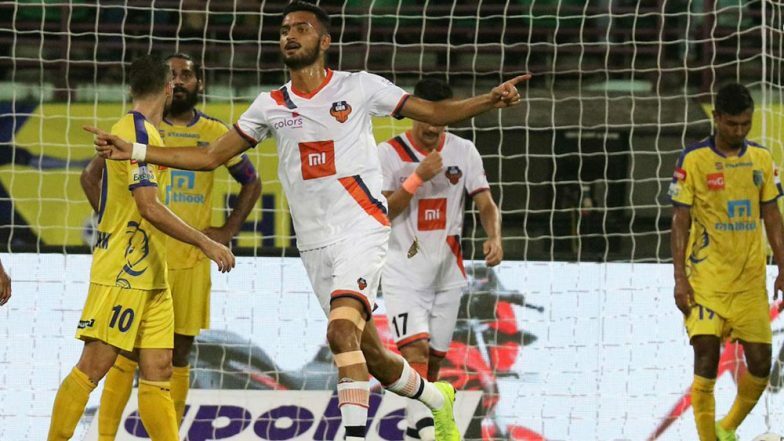 Where to Watch Free Live Online Streaming of FC Goa vs Kerala Blasters FC, Hero ISL 2018-19, Football Match? If the fans want to watch the match via online streaming, then they will have to log on to Star Sports’ live streaming service, i.e. Hotstar. However, if the fans want to read the latest updates about Delhi Dynamos vs Kerala Blasters match, then they catch them by clicking here!